Then: The most famous intern in history didn't stumble into the President's company by accident. Once an overweight, black-clad California teen, the Lewis & Clark college grad set her sights high when she arrived in Washington (George Stephanopolous was another alleged target of her friendship). But her relationship with the President wasn't purely tawdry. They exchanged gifts: she gave him neckties, an antique paperweight, sunglasses and a mug that read "Santa Monica," among others items. He reciprocated with brooches, a marble bear figurine, and a copy of Walt Whitman's "Leaves of Grass," according to a deposition Lewinsky gave in 1998. The impact of her dalliances have been endlessly parsed, but in the end, Monica probably put it best herself. "I'm well-known for something that isn't great to be well-known for," she reportedly said in 1999. Now: For the first few years following the scandal, Lewinsky wasn't exactly a recluse. She moved to New York, released a line of handbags bearing her name, and developed, in certain circles, a reputation as an ebullient charmer. "She's dazzling," an acquaintance told New York magazine in 2001. "Spend two minutes with Monica and you understand exactly why the president became so smitten." 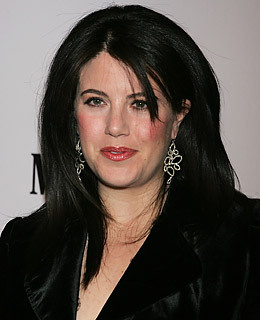 Lewinsky also took to TV, doing spots on Saturday Night Live, an appearance on the Tom Green Show and hosting the short-lived FOX reality show Mr. Personality. Ultimately, though, New York wasn't far enough from the Beltway to escape her past; dating is difficult, unsurprisingly, when intimate details of your love life have been the subject of congressional hearings. "It's not like I can just go and get a job somewhere. People aren't jumping to hire me," she said in 2001. Four years later, Lewinsky lit out for London, where she enrolled in a master's program in social psychology at the prestigious London School of Economics. (She earned her degree the following year.) Since then, Lewinsky has eschewed the spotlight. In response to an interview request from TIME, her former publicist and friend Barbara Hutson said that Lewinsky is attempting, as best as possible, to avoid any publicity.